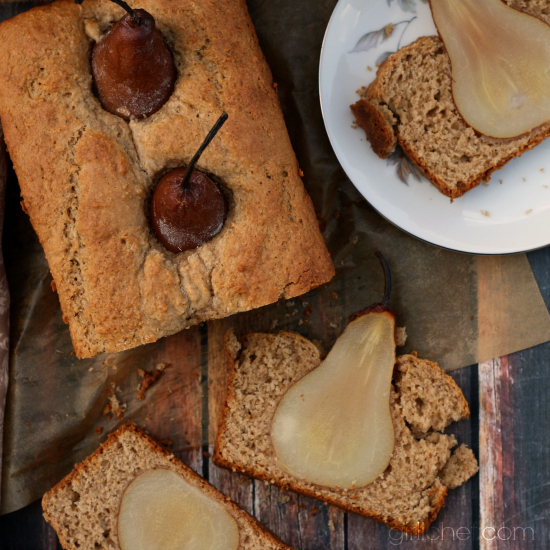 The tender poached whole pears peeking out of this spiced buttermilk quick bread make it a real show-stopper, and I'm using it to conjure up autumn—crisp air, sweatshirts, apple cider, football, and bonfires. 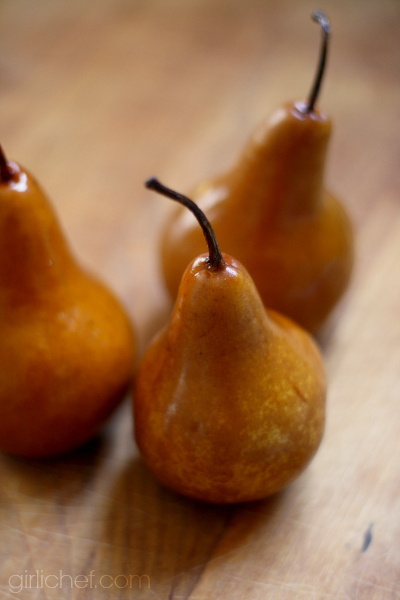 This month's #TwelveLoaves theme of pears gives fall a nod, as well. As soon as I knew our theme, I knew what type of bread I'd be making. I have a similar version bookmarked in several places. 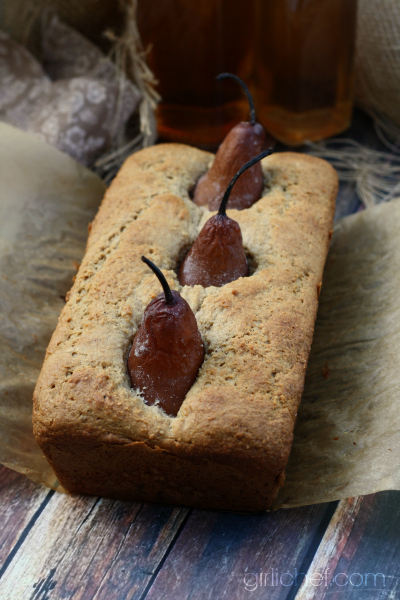 Basically, it's a quick bread with poached pears taking center stage. It's pretty simple to switch up. 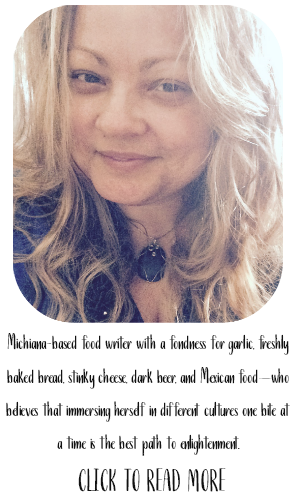 It really just depends on what type of quick bread you want to pair with it. Since I'm in that autumn state of mind, I wanted something speckled with warming spices, and thought that a buttermilk quick bread would play the perfect host. Combined with pears that were also quickly poached in a spiced simple syrup, it really does taste like cooler days. The bonus is that you wind up with a nice cocktail mixer once you've lifted the pears from the spiced simple syrup and then strained it. How about you, are you ready for fall—or are you an eternal summer type of person? 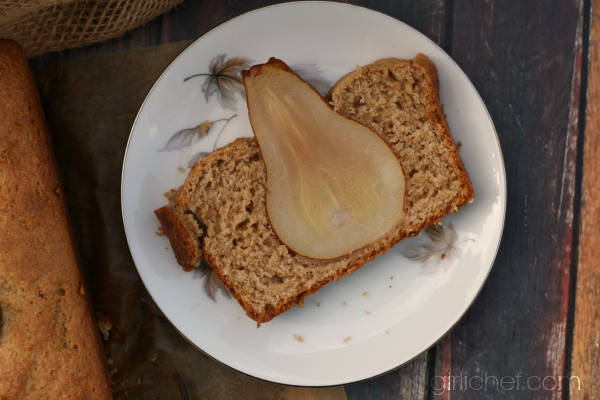 Do you have any favorite bread recipes that feature pears? If so, please feel free to leave a link to them in the comment section. 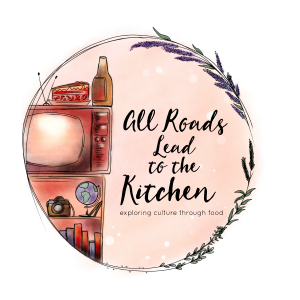 For more pear bread inspiration, scroll down and see what my fellow #TwelveLoaves bakers brought to fill the basket this month! 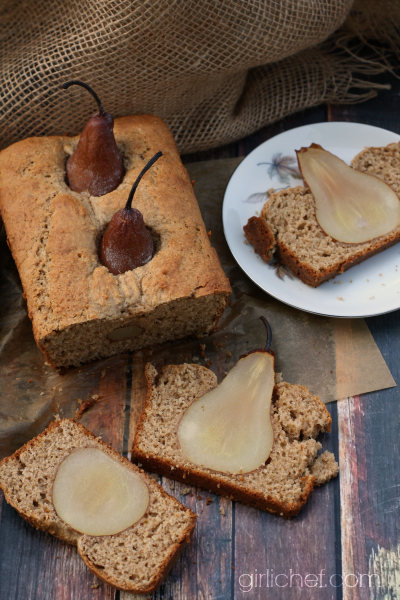 The tender poached whole pears peeking out of this spiced buttermilk quick bread make it a real show-stopper. 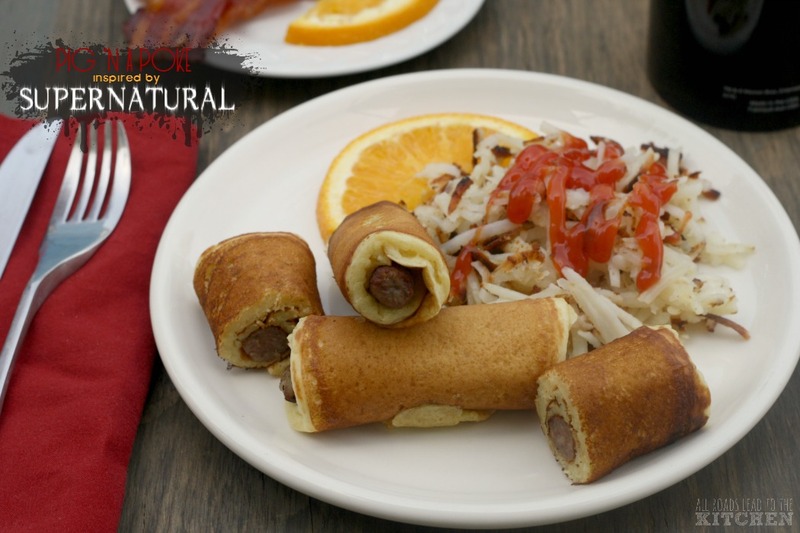 Serve at your next holiday gathering. Put the water, sugar, and spices in a medium pot and bring to a boil. Reduce heat and simmer for 5 minutes. Carefully lower in the pears and simmer for 5 minutes. Carefully lift the pears out of the syrup and let them cool. Strain the syrup and save in the refrigerator for another use (like sweetening a cocktail). Trim a small slice from the bottom of the pear, mainly so that it sits flat, but also to be sure that the pear is not too tall; they should rise about 1/2-inch or so above the rim of a 9"x5" baking pan. If you want to remove the cores, use the small end of a melon baller to remove it. Fill the bottom of a wide mug with a couple of inches of flour. Snuggle each pear into the flour, coming about 1/2 - 2/3 of the way up. 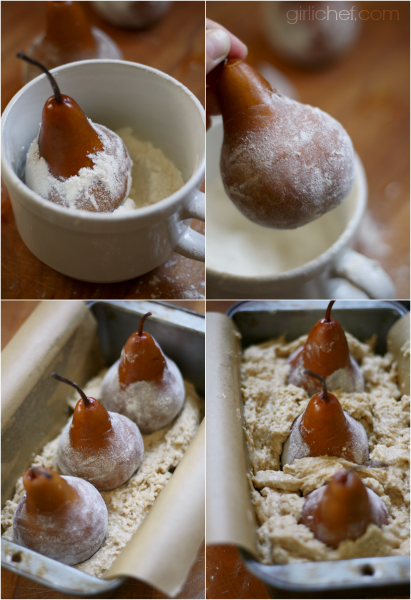 Dust off any extra flour, so that just a thin coat remains on the pear (this helps it stick to the batter as it bakes). Preheat the oven 350° F. Grease a 9" x 5" loaf pan, then line with a strip of parchment paper or foil for easy removal; set aside. Whisk together the dry ingredients. 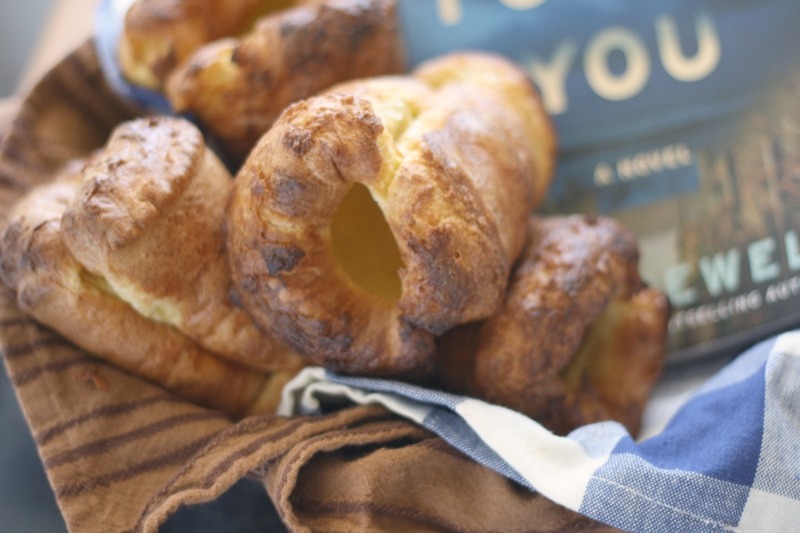 Make a well in the center of the dry ingredients and add the buttermilk, melted butter, and egg. Whisk the wet ingredients together, then use a wooden spoon to bring the wet and the dry ingredients together until combined. 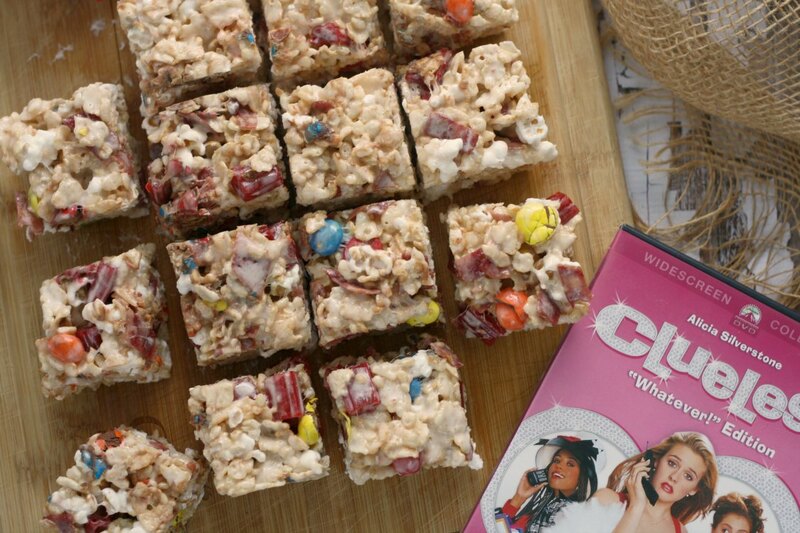 You should have a thick batter. Pour a 1-inch layer of batter into the prepared pan. Set the pears in gently, spacing them evenly apart. Carefully add the rest of the batter to the pan, pouring around (not over) the pears, as they should stick out. Slide into preheated oven and bake for 50 minutes, or until the bread is golden and a toothpick inserted in the center of the bread comes out clean. Let the bread sit in the pan until mostly cool, then grab the parchment or foil "handles" and lift out. 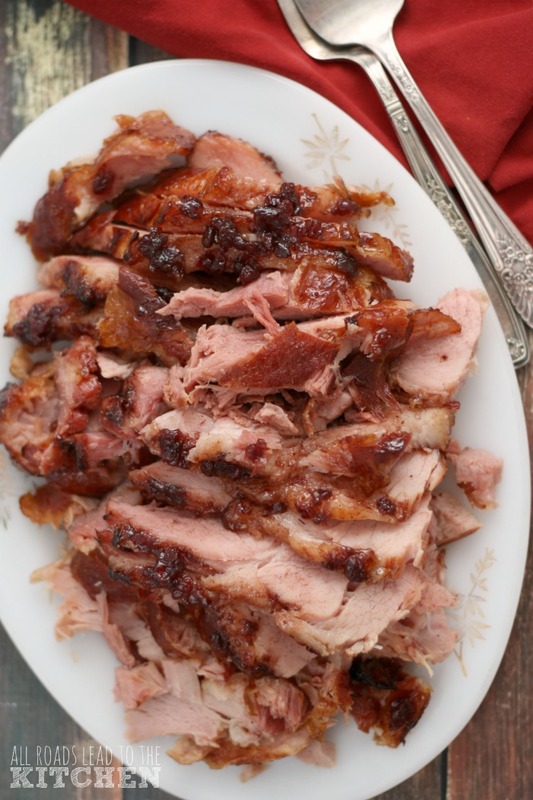 When ready to serve, carefully cut slices using a serrated knife. This is best eaten on the day it is made, but can be stored in a paper bag for a day or two, if need be. 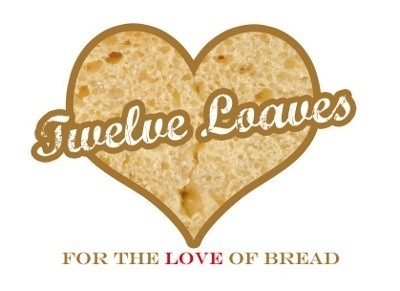 Twelve Loaves is a monthly bread baking party created by Lora from Savoring Italy, run with the help of All Roads Lead to the Kitchen, and hosted this month by Camilla from Culinary Adventures with Camilla.